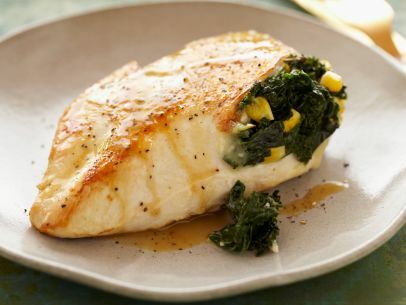 I think this spicy kale and corn stuffed chicken breast looks quite good. This is actually a quick recipe, and if you have frozen veggies, you’re ready to go since you won’t have to do any chopping. Plus, you cook it in a saute pan and wouldn’t need to wait for the oven to heat up. My favorite part is creating the pan sauce after. I’ve been practicing doing this. Some hits, some misses. 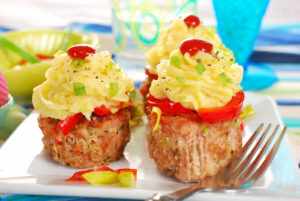 But it is a great way to finish up some dishes and make it feel restaurant quality. You can see the whole recipe here on the Food Network. Ok, I confess. I don’t like kale. I would use spinach, collards or Swiss chard instead. And I would get it fresh and chop it up. For the chard, I’d cook the stems for a little bit first and then put in the leaf. Plus, I’d add in some diced onion. I buy bags of it frozen from my local supermarket. The diced ones in the refrigerated section are fine, but they never last as long as I’d like. You could use shallot instead of garlic. And feta instead of pepper jack cheese. And my favorite Mexican Velveeta! I know, I have some issues with Velveeta. Some people in the comments didn’t feel it was truly spicy enough. So you may want to add in some red pepper flakes or jalapenos or a little adobo sauce. I couldn’t use corn because my husband would complain. He loves corn on the cob, but doesn’t like corn in anything. So I could use jicama, bell pepper, or even some finely diced potatoes. You could make some Spanish rice (with brown rice for more fiber, preferably). I’d also have a salad. The amount of kale and corn really don’t add up to enough veggies. It could be good with some pureed parsnips since the gentle sweetness would work with the spiciness. Also, some steamed or roasted small or fingerling potatoes would be a creamy companion.